I ran across this site when I was desperately searching for that other coffin quilt. It’s kind of a weird hybrid: The quilt imagery is based on tattoos, but the quilt itself is in the shape of a toe-pincher coffin. For some reason I’m having a little trouble wrapping my head around this; it sort of seems like too much of a good thing. However, the applique work on these quilts is amazing, and well worth a look for that alone. The artist also makes a number of items not on display in her gallery, including aprons, bags, and baby booties. In addition to the standard vacation photos and general ephemera that makes up the bulk of Flickr, there are also some hauntingly beautiful galleries. Check out some of these artists’ atmospheric, creepy offerings. Lovely! The BBC Website has a short slideshow on some of the ways that we have historically confronted death. The images of death juxtaposed with children are particularly unsettling, although a couple of them would be attractive on a wall as a framed lithograph. I make art out of dead animals and other nice things. YOU buy the art, then I take the money and go buy gin. See how simple it is? In addition to a neat gallery of work, the site also includes instructions on making one’s own “deadgarden” to clean and give character to animal bones. The writing style is chatty and funny, and I’m strangely taken with Robert, The Best Dead Cat In The Whole World, featured on the home page. With a tagline like, “Whip your knitting into shape,” it’s not surprising that this site offers designs of which Aunt Bessie in Shreveport might not necessarily approve. There are several free patterns, a book you can purchase, and lots of inspiration. The site also has a page devoted to the skull pattern shown here, interpreted in all sorts of forms. I particularly like the skull and crossbones afghan done by one submitter. Billing themselves as “low fashion and rock couture,” Love from Virgil offers inspired handmade fashion and accessories. I need to find out where they score some of their fabric, too; it’d be perfect for a quilt I’ve got in mind. This looks like a fun do-it-yourself project. Plush rats are easy enough to find (although I think I’d want to go with the black or grey variety), and they could either be stitched together with heavy thread or yarn, or simply hot-glued to some sturdy base fabric. I guess you could string them together like a boa, too. It’d be cute with plush tarantulas, too. This lovely blog lists itself as “a year-round place for all things creepy.” I particularly love the “Today’s Inspiration” images (such as the one here, by demeter*): All kinds of moody, atmospheric, startling, thought-provoking, um, inspiring pictures. *I feel as though I should explain the asterisk, lest you think I forgot a footnote. There isn’t a footnote, that’s her name. demeter*. This has nothing to do with crafting or decor, other than the fact that I find him both crafty and decorative. But it’s my blog and I can do whatever I want. So there. 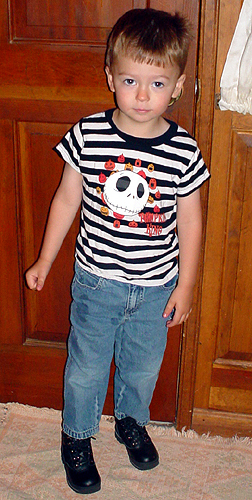 Not shown, but he’s also wearing skull-and-crossbones underpants. It’s my goal to make all the ladies at daycare juuuust a little nervous.